Afshin Shahidi peppers his new photo book with accounts of dreams he's had — dreams involving Prince. It's not surprising that Prince would appear in some of Shahidi's dreams, since the photographer spent a lot of time with the music icon for two decades. Shahidi became witness to some unforgettable moments backstage, in the studio, and on the road. 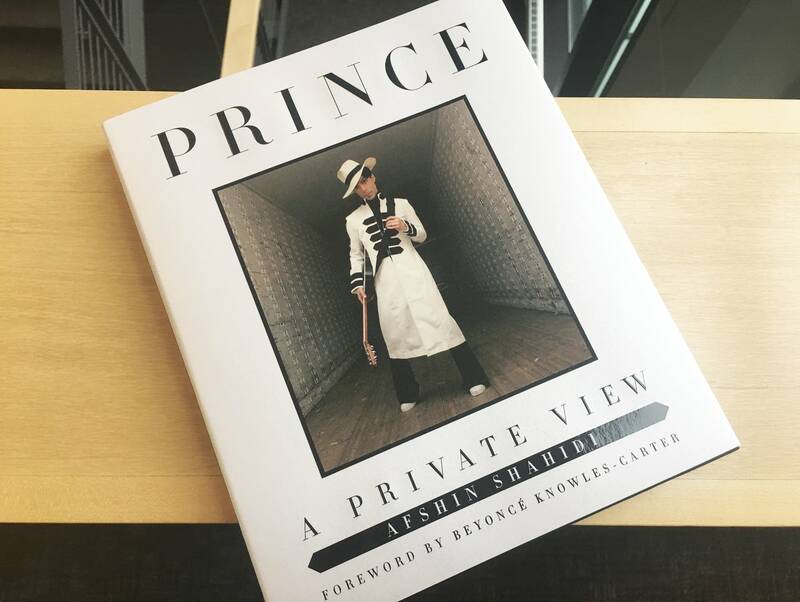 It's apt that the book is titled Prince: A Private View, since not only do the photos represent Prince in a number of quiet settings, they're accompanied by Shahidi's stories about how they were taken. We learn about how playful Prince was, how he would happily collaborate with Shahidi on shots like a back-seat flip-phone conversation, a pose in an empty gear truck, and a quick snap walking down a hallway. "I asked if he wouldn't mind walking down the hall again," writes Shahidi. "He chuckled and said, 'You know I don't do anything twice!'" Shahidi was born in Iran, and moved to Minnesota during his youth. He first started working for Prince in 1993, assisting with cinematography on video shoots. In 2001, Prince asked to see some of Shahidi's still photos, and the star liked what he saw. Shahidi would be Prince's personal photographer for the next decade, traveling with the star throughout a dynamic phase of his life and career. This was the period when Prince made a big commercial comeback with 2004's Musicology. Shahidi joined Prince on tour behind the album, and one of the book's most amazing shots shows how Prince made it out to the in-the-round stage without being seen. There was a rolling box, with a little purple bench for Prince to sit on while being rolled out to the stage right under the noses of the unsuspecting audience. The photographer was also there when Prince was inducted into the Rock and Roll Hall of Fame in 2004; Shahidi has photos of Prince strolling down a Manhattan street to rehearsal. "I don't think people were able to compute the fact that it was Prince walking by them," remembers Shahidi. Shahidi was also on hand for Prince's 2004 Grammys performance with Beyoncé, who made headlines just by writing a foreword for the photo book. Shahidi remembers Prince praising Beyoncé repeatedly. "'Real music by real musicians,' he would often say. 'She's one of the real ones.'" The book is also fascinating for its descriptions of just how Prince managed his image. Only a few of the photos in Shahidi's book could properly be described as candid shots; in most cases, it seems, Prince or Shahidi would suggest a venue and theme for a photo shoot, and the photographer would show Prince a quick test shot to convey a sense of generally how it was going to look. If Prince approved, they'd keep shooting. Among the most recognizable images Shahidi shot is a photo of Prince with arms outstretched, the basis for a Paisley Park mural paying homage to Prince's influences; we see in the book that it was heavily edited from an original photo taken among equipment carts backstage. He also shot the cover of Prince's album 3121 (2006), which was a very simple shoot with an ordinary floor lamp and a blank white wall. 3121 was the street address for Prince's first Los Angeles house, and a number he affixed to each of his subsequent L.A. pads. Those houses saw some legendary parties, and Shahidi was the house photographer. There are four double-page spreads of shots that you can pore over to spot the likes of (deep breath) Morris Day posing with Queen Latifah; Prince chatting with Dustin Hoffman; Prince jamming on keys with Stevie Wonder, as Matthew McConaughey plays congas in the background; Justin Timberlake DJing; Samuel L. Jackson hanging out with Laurence Fishburne; Wendy Melvoin hugging Dave Chapelle; Jimmy Jam and Terry Lewis looking fly as ever; Maroon 5 looking awkward; and, maybe best of all, Joni Mitchell shooting pool. In the first dream he recounts, Shahidi is being flown in a helicopter that veers crazily from one side to another, with the dreamer almost falling out. Finally, the chopper rights itself. "I catch my breath and composure," describes Shahidi. "I look forward and see Prince laughing. He is the pilot. He winks and tells me to hold on." Recently, Afshin Shahidi spoke with Cathy Wurzer of MPR News. Below is a partial transcript of their conversation. Cathy Wurzer: He [Prince] was a guy that, clearly, was fiercely protective of privacy. How much freedom did you have to take photos of him when he wasn't in public? Afshin Shahidi: As we built our friendship and working relationship and the trust was there, I had complete freedom. He also knew that anything I took, he would be able to look at and approve or say: "I don't like that, get rid of it." I had free rein. Now, there were times where, I got to know him and I knew that he may not want to be photographed. If he was in a deep serious conversation, I wasn't about to interrupt that by standing there taking pictures. I understood when were good times to be photographed, but other times too I knew that if he gave me a little look that it meant "Let's not take any pictures right now." Outside of that, I was able to do whatever I wanted. A lot of the times I was able to say: "Hey Prince, will you come over here? I think this would be a great place for a picture." I think my favorite moments, really, are the unguarded moments. We expect to see Prince posed in a portrait or even live on stage, and those are fantastic. But I feel like the moments that I was able to capture where he was not aware of the camera or he was so relaxed that he didn't care it was there kind of show a different side of him that we usually don't see. I think page five might be what you're talking about. There's a lovely photo of Prince; he looks very relaxed. He's got his eyes closed. He's at the Kodak Theater in Hollywood during the One Night Alone Tour, is that what you're talking about? Yeah, that's one of those moments, absolutely. Any time that I was able to capture something like that, whether it was on the road, or that was during a soundcheck...I think I said in there, if the soundcheck was going well, he was very relaxed. If they didn't, then he worked up until the last minute before the doors opened to get the sound as perfect as possible. It doesn't sound like this is a guy that gave a lot of feedback. I had to keep remembering that this was a person that, when I was in high school, had already toured the world and been in front of movie cameras and still cameras. He knew so much more about it than I did. It was a learning process for me, working with Prince. I grew as a person, but I also grew as a photographer, technically and creatively, working with Prince. He would give me pointers, occasionally. He'd say: "Let's make it a little moody. Let's turn this light off." Occasionally, he'd walk in and I'd have something lit and he'd point and he'd say: "Let's turn that light off." I'd turn it off and it'd end up being better. So, he knew what he was talking about. It looks like he definitely did trust you, and I say that because the images, especially four images where he's a little playful. When I saw those four photos I thought: "I've never seen Prince like that!" It was after hours and you guys evidentially were talking about a manner of different things and he looked like he was relaxed enough to trust you, to just kind of be himself. That was in New York City. I have a wider shot, but I think Morris Day happened to be there. I think Lenny Kravitz was there. We were sitting at a table just chatting. I had my camera, and I was part of the conversation, but I would pull it out and take a few pictures. He was completely fine with that. It was those moments that I really loved. I think it's those moments that a lot of fans have not seen, so hopefully it gives them a glimpse into the human side of Prince.